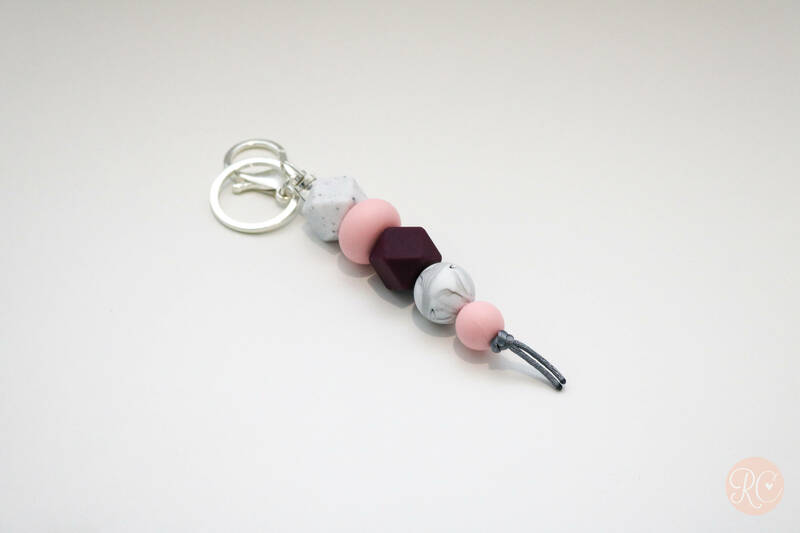 PRE ORDER - will send after April 28th - Marble, Pink and Plum Silicone Beaded Keychain. This Keychain is made from food grade silicone and contain no BPA, Lead, Cadmium, Phthalates, PVC and Latex. Beads will not absorb odours or support the growth of mould, fungus or bacteria. Wash with warm soapy water. Made on a nylon thread. The keying measures 17cm give or take a few mm for the thread length. The beads vary from 14mm at the smallest and 19mm at the largest. I can adjust the keychain to be longer or shorter. I can also do this with different coloured beads. Everything is super cute and what I wanted, the only bad thing is that the clasp donation close all the way. It’s enough for the key ring to slide off easily. Loved my lanyard so much that I got a keychain too! The colours are gorgeous and I love the soft beads! Amazing quality! Gorgeous, I love it! Super cute accessory for all my keys!! !